Grilling a la plancha (“on the griddle” in Spanish) is an easy upgrade to your charcoal kettle grill or gas grill. A simple setup—a carbon steel plancha set over a grill grate—opens a world of possibilities. Marbled cuts of meat won’t flare up or dry out, veggies won’t fall through the grill grate, and hard-to-sear items, like citrus and avocados, can be charred and caramelized. 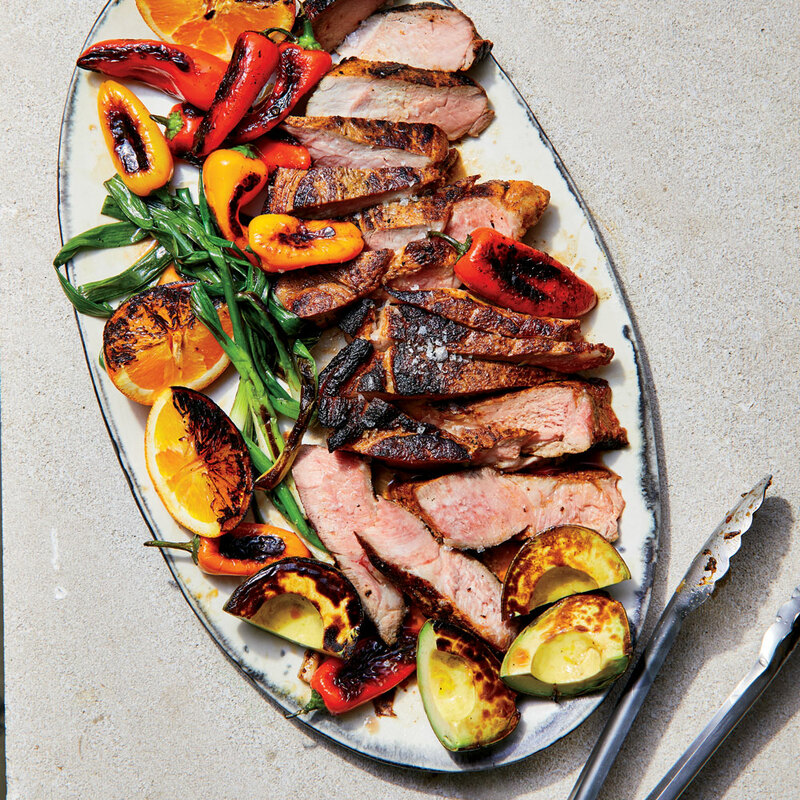 Master these basic steps, and then check out our favorite weeknight-friendly plancha recipes. Fill each of 2 charcoal chimneys with approximately 3 pounds of hardwood charcoal. Light charcoal and let burn until flames subside and coals glow bright red, about 25 minutes. Carefully pour charcoal into kettle grill, and let burn until coals are covered in a thin layer of ash, about 5 minutes. If using gas grill, heat all zones to high (450°F to 550°F). Use a wok spatula to arrange coals in an even rectangular layer. Set grill grate in place, and set plancha on grate over bed of coals or gas flames. Let plancha heat 10 minutes. Toss vegetables and rub meat with neutral oil. Never add oil directly to the surface of the plancha (it may ignite). When plancha is very hot (water dropped on plancha will bead), use tongs to add ingredients to plancha in a single layer. Sear ingredients until charred on one side, and then flip and cook to desired degree of doneness. Clean the plancha while it is still hot. Soak several paper towels with water, and roll them up together like a cigar. Using a pair of tongs to hold paper towels, rub surface of plancha to remove residue. Let plancha and grill cool before removing plancha. Plancha: We love the Lodge Carbon Steel Griddle for its handles, slick cooking surface, and generous 18- by 10-inch area that fits on standard charcoal grills. Wok spatula: Intended for cooking over high heat in bowl-shaped woks, this long-handled spatula is perfect for spreading red-hot coals. Grilling gloves: Made from flame-retardant material, grilling gloves make it comfortable to work over a hot bed of coals. This article was written by Mary-Frances Heck from Food & Wine and was legally licensed through the NewsCred publisher network. Please direct all licensing questions to legal@newscred.com. The heat of the Spanish plancha grill creates a beautiful crust, while keeping meat juicy in the center. Give this unique griddle a try with recipes like Crusted Fish and Ratatouille a la Plancha and Plancha Grilled Bread.